Introduction: Ball Pythons are among the most popular species of snakes kept as pets due to their relatively small size (length between 3'-5'), non aggressive nature, and fairly straight forward care requirements. In the wild, they are found in central and West Africa often spending most of their time in abandoned rodent burrows or termite mounds. Though varying patterns exist in wild populations of ball pythons many new colors and patterns have been developed in ball pythons through selective breeding. Housing: Several options exist for housing a ball python including tanks (with locking screens as many snakes are wonderful escape artists), plastic tubs, or custom built enclosures. Ball pythons up to 2' in length can be housed in a 10 gallon aquarium or an enclosure of similar size. Past 2' they will need space measuring 36"x18"x12". Regardless of what type of housing you choose, proper substrate and hides need to be provided to keep your snake healthy and content. Recommended substrates include print-less newspaper, aspen shavings, paper towels and cypress mulch. Pine and cedar based products should be avoided as they can be harmful to a variety of reptiles and small mammals. Since ball pythons spend a lot of the time in the wild hiding it is essential to provide hides to help make them feel secure and cut down on stress. At least two hides should be provided, one on the warm side and one on the cool side so they can feel safe regardless of the temperature gradient they desire. Heat and Lighting: Being a nocturnal species, ball pythons do not require any special lighting but do well with a day/night cycle provided by ambient room lighting. As mentioned in the Housing section, ball pythons require a warm side and a cool side in their enclosure. The cool side/ambient temperature should be around 80 degrees and the warm side/basking spot should be around 90 degrees. Being nocturnal, bright lights should be used to create these temperatures and instead it is advised to use a UTH (under the tank heater) or specially made heat tape for reptiles which are both described on The Right Supplies section of this site. Humidity: Humidity should be between 50-60% and upped to 60-70% during shedding. Humidity can be measured using a hygrometer and should be monitored frequently to ensure it's staying within the accepted ranges. If the humidity is too low it can be upped by misting the enclosure, placing the water bowl above the heat source/on the warm side, using a humidifier, or by providing a moist hide. Water: A clean bowl of water should always be available for your ball python. Use a heavy or weighted bowl so your snake cannot tip it over. Some snakes will defecate in their water so it's important to check for this and fully clean the bowl before refilling and putting it back in the enclosure. Feeding: Ball Python Care has a detailed article on feeding including what to feed, what size prey to give to your snake, and some of the more common reasons why a ball python might not be eating. 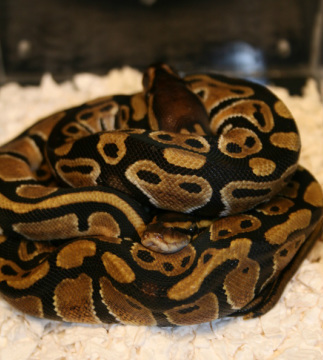 Interesting page detailing ball python genetics. Ball Pythons are named for the way they form a 'ball.' The photo above is actually two young snakes.